The year was 2010. David Sullivan, David Gold and Karren Brady signed a deal to move West Ham United into the Olympic Stadium. The transition would see Upton Park, home of West Ham since 1904, demolished. The stadium which England’s greatest ever player, Bobby Moore, graced for 16 years. The stadium which saw Paulo Di Canio score the greatest goal in Premier League history, right in front of the West Ham crowds. It was a classic location for international football, for example when thousands of West Ham supporters came to watch the best footballer in history, Lionel Messi, play at the Boleyn ground in 2014. It saw club legend Mark Noble have a memorable testimonial (my last ever game at the ground), featuring some of West Ham’s best ever players. Upton Park’s dying days involved a season consisting of incredible wins against Chelsea, Liverpool, Tottenham and most notoriously – Manchester United. Every single West Ham United fan, whether watching it from home or sat in the ground, emotionally witnessed Bobby Moore turn the lights off at Upton Park, for the final time. A lifetime of memories and history was released from the desperate grip of West Ham fans, forever. But why? David Sullivan and David Gold, sat in front of a press conference eight years ago, explained why West Ham United were transitioning to the Olympic Stadium. “We will have the cheapest Premier League prices in the country. We want football to be affordable for the ordinary working class man, not just the corporate people,” said Sullivan. As soon as we moved into the Olympic Stadium, ‘Kids for a quid’ and ‘half price adult tickets’ were immediately scrapped, whilst U16s are charged £70 for a Band 1 ticket. “The seats behind the goal are even closer to the pitch than they are at the Emirates Stadium. The sight lines from EVERY part of the ground are better than Wembley,” bragged Sullivan. 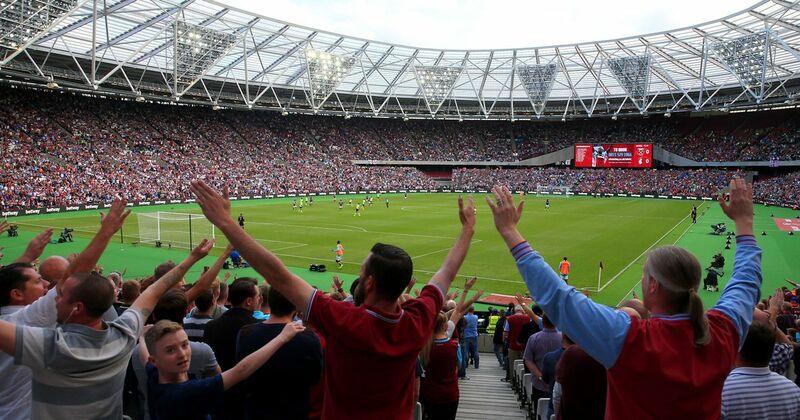 Since moving, West Ham have been ridiculed as thousands of fans have snapped photos of their view, where the ball is almost invisible from sight. Six years later, West Ham’s notorious ‘castle’ crest, reading ‘West Ham United’, is thrown in the bin for a plastic, corporate logo reading ‘WEST HAM LONDON’. The board made a £183.3million record turnover last year. The club also made £28.4 million on player sales. In the summer transfer window, instead of investing off the back of a disastrous first season at the new stadium, the board pocketed an additional £5 million from selling key players of our squad. In January 2018, with West Ham in extreme danger of relegation, the board sold Ayew and Fonte for over £20 million. No replacement for Fonte came in. An inexperienced striker from Preston North End replaced our £18 million forward. The board intentionally weakened the team to fill their pockets. It is now March, and West Ham sit in 16th, with the majority of fans adamant that we will not win another game. And then came the extensive documentary from Karren Brady about the Olympic Stadium. “The seats will not be black and white, they will represent the colours of West Ham United,” she said. “A state of the art digital wrap will go RIGHT AROUND the stadium,” she said. “Our job is to exceed fan’s expectations, and we will certainly do that” she said. Brady looked at every single one of you West Ham fans, straight in the eye, and told you these lies. She knew what she was doing. She strapped you of your hard-earned cash, to fill her pockets, and she did it by deceiving the club you love. The stadium is the biggest problem. West Ham United get relegated this season, and we officially die. A soulless, corporate, white bowl with 40,000 empty seats will look down on Mark Noble playing with ten youth players against Burton Albion. If the board are still in charge, does their track record make you think they will invest to get us back up to the Premier League? No – they did the same to other historical clubs, like Birmingham, and they will do it to us as well. If they are in charge, we will never go up. Get that idea in your head – West Ham United will NEVER play in the Premier League ever again. You will never take your children to a West Ham Premier League game. They will never know what West Ham really was like. And now, if we are lucky, the board will sell up. They walk away with hundreds of millions and go live in their extravagant mansions. What do they leave behind? Us. As West Ham dies, our commitment will eventually die too. We will slowly lose our will to sing, support and cheer. Nevertheless, us West Ham fans bleed claret and blue so much that we will desperately try anything to stop this scenario from happening. Of course, actual abuse isn’t acceptable and it is okay for the media to criticise those West Ham ‘fans’ running on the pitch, and being disruptive and unhelpful. But talkSPORT claiming that West Ham fans ‘abused’ our owners, by stopping them to ask questions about the demise of our club, is unacceptable. Of course, the media will pull the age card – ‘David Gold is 81, you can’t have a go at him’ – if you take the responsibility of owning a football club, and intentionally destroy it in front of their fanbase, you cannot hide away because you’re ‘too old’ to face the uproar. They need to deal with the consequences of their actions. I don’t support legitimate abuse towards the owners, but the fans chanting their dislike of the board around the director’s box? Perfectly fine- in fact, the way the owners were hurt is just a FRACTION of the pain which West Ham fans have felt. To any wealthy media figures blaming West Ham fans for the state of the club, from their pedestal in a corporate office – don’t chat rubbish about what you don’t know. You haven’t been robbed, you haven’t been deceived, you haven’t had something you have loved your entire life stripped from you – let us passionate, die-hard fans freely battle the sad, emotionless, corporate industry of modern football. What a heartfelt and true record of the events, 53 years a fan and its all being eroded by greed of the 3 most insincere people you could ever imagine running our beloved Hammers – shame on them. Very well put & also true. The Hammers supporters are being robbed of Premier League football so that a few people will get rich. Brilliantly written article. From the heart that those greedy bastards are trying to rip out.